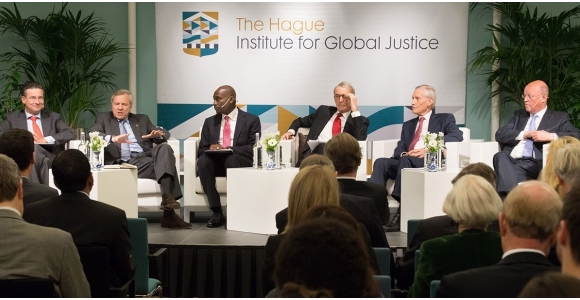 On 11 December, The Hague Institute hosted a rare gathering of four former Ministers of Foreign Affairs of the Netherlands. This event, the culmination of The Hague Institute series, An Inside View: The Effectiveness of Dutch Foreign Policy, was a unique opportunity for a wide-ranging discussion with those who have held ultimate responsibility for the international engagement of The Netherlands over the past decade. It followed previous sessions with former Political Directors at the Ministry of Foreign Affairs, as well as former Dutch Ambassadors to the United Nations. The session was opened by Jaap de Hoop Scheffer (Foreign Minister, 2002-2003), who discussed three landmark events over the past decades, each corresponding to three traditional ‘anchors’ of Dutch foreign policy. The first event, the hard-won decision of The Netherlands, in 1979, to remain a NATO ally and to station cruise missiles on its territory evokes the ‘NATO anchor’. The second event, the ‘loss of Dutch naiveté’ as regards its preference for multilateral security actions following the fall of Srebrenica in 1995, represents a ‘rules-based anchor’. Traditional certainties surrounding the final anchor, the European Union, were also cast into doubt by the rejection by the Dutch, in 2005, of the European Constitution. These turning points, de Hoop Scheffer argued, are reminders of the key threads of Dutch foreign policy, and though they have each shaken traditional assumptions, they have not as yet overturned the standard anchors of The Netherlands’ international engagement, which remain essential lodestars for the future. Bernard Bot (2003-2006), reflected on the balance between reactive and proactive inclinations in Dutch policy, arguing that the latter ought to take priority. The reactive tendency, he proposed, has too often caused The Netherlands to shy away from engagement in international affairs. This habit was deemed ascendant, with inward-looking attitudes increasingly the norm; a lack of foreign policy expertise in government and parliament and insufficient attention given to the international equities of Dutch economic actors. Bot was particularly concerned about the implications of such attitudes for the Dutch relationship with the EU, given the reduction of a country’s capacity to influence affairs at the European level if its stance is perceived by European partners as comparatively insular. Bot’s prescription was to improve the ‘brand’ of The Netherlands abroad, and to emphasize the link between business interests and consistent international engagement. Maxime Verhagen (2007-2010) was the third Minister to speak. He echoed earlier comments in the Inside View Series about a breakdown of internal consensus, epitomized by the rejection of the European Constitution, the findings of the Davids Commission and the fall of the Balkenende government over Dutch involvement in Afghanistan. Decisions are too often made in a shortsighted way, Verhagen argued, with further work necessary to combat a popular tendency to ‘retreat behind the dykes’. He further argued for improved linkages between the work of the Foreign Ministry and other government departments. As well as paying attention to domestic constituencies, Verhagen underlined the need for The Netherlands to consolidate relations with international partners, especially within the EU. He also rejected the idea that values and interests were inevitably in tension, arguing that enlightened self-interest – allowing the simultaneous pursuit of economic interests and international human rights standards – could be a guiding principle of foreign policy engagement. The tension between values and interests is not an irreconcilable one, rather the two are inter-related, leaving The Netherlands well-positioned on both fronts. Referencing the rise of Asia, as rebalances in global power accelerate, Rosenthal remarked, The Netherlands should concentrate on promoting power sharing rather than power shifts. An intervention by Bernard Wientjes, chairman of the VNO-NCW employer’s association, set the tone for the first segment of the debate that followed. Noting that The Netherlands’ first Ambassador to Turkey had been paid, 400 years ago, by the business community, Wientjes gave examples of the support that businesses are continuing to give to diplomatic efforts, arguing that the Foreign Ministry must also play its part, especially by making a clearer link between active international affairs policy and economic concerns of ordinary people and enterprises. There was agreement on the importance of economic diplomacy, but the Ministers also emphasized that not all elements of foreign policy can be directly reduced to economics alone, even if the indirect contribution of foreign policy aims will redound to Dutch economic advantage. Seeking membership of the United Nations Security Council (UNSC), for example, has supplementary dividends for Dutch corporations in terms of the international brand of The Netherlands and the opportunity to take part in decisions on crucial issues such as sanctions policy, but is also a position which, more broadly, helps to craft a rules-based international order which is essential for commerce. From L-R: Maxime Verhagen, Jaap de Hoop Scheffer, Abiodun Williams, Boudewijn van Eenennaam, Bernard Bot, and Uri Rosenthal. ‘Taking sides’ through membership of bodies like the UNSC is not a responsibility that The Netherlands should shirk the Ministers agreed, even if business relations might sometimes be affected in the process. This is a constant balancing act, de Hoop Scheffer added, though even contentious issues can be raised with international partners if the approach is a respectful one, both Verhagen and Rosenthal posited. Asked to provide the contours of a Dutch ‘pitch’ to UN Member States voting on UNSC membership, the Ministers focused on The Netherlands’ traditional engagement in multilateral security operations, its high levels of development spending and the Dutch capacity to act as a ‘honest broker’ through its international orientation and first-rate diplomatic corps. The proposed deployment of Dutch special forces to Mali, under the UN peacekeeping mission, provided a further subject for debate. Jaap de Hoop Scheffer noted a long-term trend towards the demilitarization of Europe, which will be incompatible with the desire to send forces abroad to assist in peace and security missions. His stressed that the success of the mission in Mali would depend on the command structure that the UN adopts. Dutch forces must have the scope to act on their own initiative, he underlined, a sentiment with which Maxime Verhagen was in agreement. Bernard Bot added that resources are an important factor, but so is the appetite of countries like The Netherlands for international security obligations. In Uri Rosenthal’s view, Europe should increasingly become a ‘producer’ of security rather than a ‘consumer’. He further commented that the decision to deploy forces to Mali was guided in part by political preferences , whereas de Hoop Scheffer argued that no one political party was the arbiter of current and future Dutch involvement in Africa. Relations with the EU and combating anti-European sentiment within The Netherlands was a key theme of the discussion. Bernard Bot, a longtime Permanent Representative of The Netherlands to the EU stressed that political leaders must make a positive case for the European Union, rather than merely focus on its shortcomings. A failure to do so, Maxime Verhagen added, leads to Eurosceptic parties registering ever-greater support at successive elections. Jaap de Hoop Scheffer similarly noted that the mainstream parties must be honest with the electorate and do more to convince voters that the upper limits of democratic legitimacy do not stop at The Netherlands’ borders. For Uri Rosenthal, who voiced his general agreement, there were legitimate issues with regard to competencies that many people wish to see returned to the national level. Asked about the possible referendum in the UK on EU membership, most of the Ministers stated that they did not expect the UK to leave and that it was in The Netherlands’ interest for the UK to continue playing a strong role within the EU, particularly with regard to EU external relations. Verhagen added, nevertheless, that pundits had been surprised by the Dutch rejection of the European Constitution in 2005, so policy-makers must prepare for any eventuality. The Hague Institute will continue its work on the effectiveness of Dutch foreign policy, including in a forthcoming publication, which will draw on the discussions during the Inside View Series. The results of this process are intended to be of use to current and future policy-makers, and all those committed to strengthening the international engagement of The Netherlands.